There's a reason why they're called tattoo artists because these inked designs are actual ~*art*~. 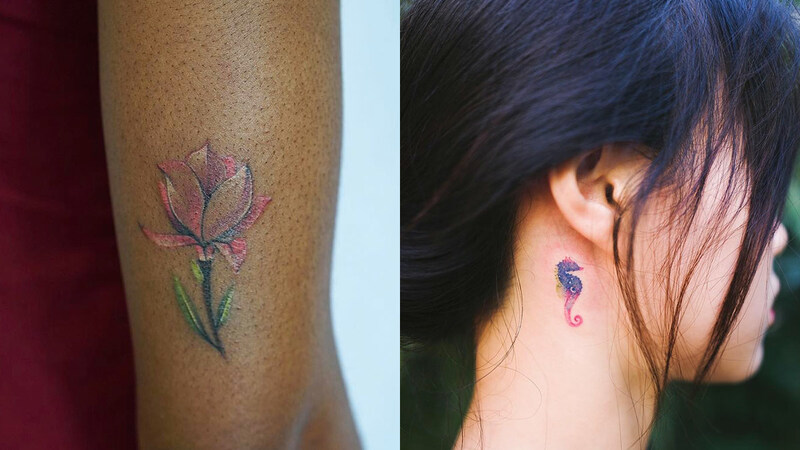 So, whether you're considering getting a tattoo for the first time, looking to get another, or just simply enjoy cool tats, these 21 Instagram accounts will give you major inspiration. Keith, or Bang Bang as he's better known by, is a popular tattoo artist based in NYC. You might have seen the tats he's done for Rihanna, but he's also a go-to artist for many other celebs, such as Cara Delevingne, Justin Bieber, Miley Cyrus, Kylie Jenner, Selena Gomez, and more. Gabby's Instagram feed features a lot of ribcage tats, like this seaside sunset pictured here. Her dainty and whimsical designs feature everything from nature to abstract line work to sentimental quotes. Jess' Instagram page features plenty of minimal tats, but she's also known for her sketch-like floral designs. But don't sleep on her smaller emoji-like designs, which are also extremely adorable! Stephanie creates tattoos that look like legit paintings. Various flora and fauna designs are often featured on her page, not to mention clients with intricate life-like tattoos based on all things nature. The Barcelona-based artist specializes in gorgeous black-and-white tattoos with a lot of contrast. His designs commonly feature moths, flowers, birds, oh, and also skulls. If you're a fan of impressionist-style paintings (think Van Gogh's "Starry Night"), Wachob is definitely an artist to follow. She makes tattoos look like colorful brush strokes, like the one pictured here, but she also creates abstract eyes and other shapes, as well as more realistic designs. If you're interested in tattoos of the hand-poked variety (aka stick and poke), you'll want to follow Lara's account asap. This artist typically uses black ink, but occasionally uses white, as pictured here, and color. Rita creates the most life-like tats, modeled after actual plants that her customers bring in. She achieves this effect by using ink to first stamp the outline of the plants onto the skin, and then uses permanent ink to create the realistic details of the tattoo. Brian Woo, better known as Dr. Woo, is known for his intricate designs, usually created with very thin lines, like these teeny-tiny leaves on Zoë Kravitz. His other celebrity clients include Drake, Cara Delevingne, and Miley Cyrus. This LA-based artist creates her intricate designs with bold black lines. She inks mesmerizing geometric shapes, animals, and picturesque landscapes, like this sun tree-lined river bank here. If you're an animal lover, and you'd be willing to have a pic of one permanently inked on your skin, this is the account for you. This Korean tattoo studio specializes in tiny, dainty-looking designs and features animals of all kinds: dogs, cats, jellyfish, birds—you name it! These cute tattoos glow when they're under UV-light, but look like regular ol' tats in normal light. The artist often creates constellations, spacey designs, and flowers on her clients, and most of them are small and have a minimal aesthetic. Curt is known for his minimal, but powerful (and sometimes risqué) designs he creates with bold line art. His tats often feature silhouettes of bodies or other outlines with black ink and the occasional pop of red. This artist specializes in huge tattoos that often cover the client's entire back or chest. The inked designs typically involve symmetrical, intricate patterns using thick black lines that are absolutely mesmerizing. Are you a fan of bright colors? Look no further than Zihee Tattoo from Seoul, Korea! Whether you're wanting a replica of an actual painting, like Claude Monet's "Water Lilies," or something totally original, like the floral ear design here, Zihee does it all. Tamara's geometric tattoos often look like you're peering through a kaleidoscope thanks to their flawless symmetry and overlapping designs. She also specializes in a stippling technique, in which the ink is applied in small dots for a gradient effect. Mr. K has mastered the difficult balance of small, faint tattoos, and intricate detailing. This is why his clients, which include Brooklyn Beckham, Rita Ora, Joe Jonas, and Liam Hemsworth, pay him a visit for their ink. Much like the celebs she tattoos (Miley Cyrus, Post Malone, and Katy Perry), Lauren's aesthetic is quirky and not too serious. If you're looking for a fun throwback tat dedicated to your past Disney and Nickelodeon faves, she'll be your new go-to artist to follow. Lumpini inks truly vivid masterpieces on her clients that are saturated with colors, like this gorgeous fox. Originally from Sweden, her background knowledge of painting and graphic design definitely translates to her tattoos. Krissy's designs are super personal. They reference Egyptian, Indian, Thai, and African imagery, so if you want a gorgeous tattoo that resonates deeply with your culture, she's your person.